John Oliver didn't start the fire. Even before Google began banning addiction-related keywords on its Adwords platform last September, The New York Times had picked up The Verge's reporting about patient brokering in the addiction treatment industry. But Oliver's recent Last Week Tonight segment, and the Pain Funnel episode of the Reply All podcast poured plenty of fuel on that fire. The treatment industry is largely unregulated, and it's legal to call practically anything "therapy". Some treatment centers charge a lot of money. A small subset of the treatment industry was responsible for most of the abuses, and many of those players are now out-of-business. Many, if not most, of the centers who "charge a lot of money" are conscientious people who go to the extra effort to hire real medical and psychological experts, get accredited, and follow up with the alumni to make sure they don't relapse. A non-trivial number use the high payouts from their luxury clients to fund "scholarship" recovery for under-privileged addicts. After the demise of Adwords, most of the centers still-standing are those with good reputations in the medical and psychological fields. If you couldn't get referrals, you probably didn't hang on from September-to-now, and fly-by-night operations weren't getting many referrals. What's more, if a treatment center is advertising as itself, that means they're not "patient brokering". "My absolute favorite part of [Oliver's] segment is when they interviewed the folks at the super expensive $70,000/ month rehab. The owners make the straight-faced claim that they ” cure addiction” in 30 days. Really? Is that how they sucker you out of 70K? Unfortunately, desperate patients and their families believe them." "Congratulations John Oliver! 100% spot on!" wrote a Florida center, on its Facebook page. "There are so many shady companies out there. If you are going to treatment, check out the facility, go on a tour and ask if they do Evidence based treatment? Ask questions, ask if they have Joint Commission Accreditation. It’s a huge decision that should not be taken lightly. 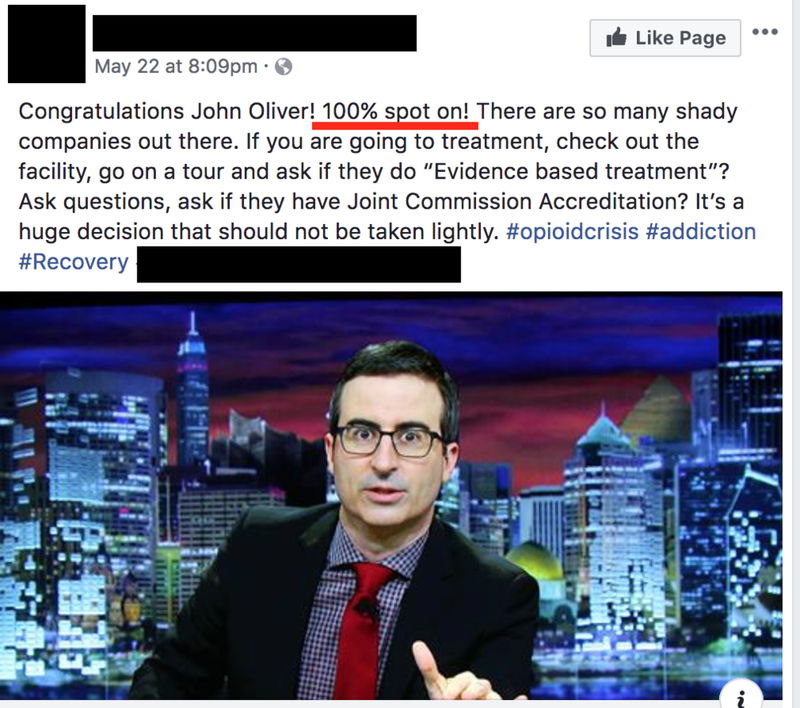 #opioidcrisis #addiction#Recovery"
"John Oliver offered a scathing and witty takedown of the addiction treatment industry on Sunday’s Last Week Tonight. We compiled sources for his video for anyone interested in exploring more about these kinds of practices #AnotherWayIsPossible." By contrast, it was nearly impossible to find a treatment provider calling out any of the misleading implications of Oliver's piece (I want to be careful not to imply Oliver was factually incorrect, only that a lot of context was missing), let-alone stand up for the industry as a whole. Individual treatment centers throwing the industry "under the bus" has become "a thing". Below, I'd like to discuss the risk the treatment industry is assuming - nay, the proverbial corner they're painting themselves into - by turning on their own. But first, a little more examination of Oliver's segment, and the criticism the addiction treatment industry as-a-whole has faced. Because it's only worth pushing back against the critics if they're getting something big wrong, or "losing the plot". Let's examine briefly the primary premises - both provable and not - that media sources, from The Verge to the New York Times, to Oliver, have floated about addiction treatment. Patient Brokering, and "Sending Patients Out-of-State"
The Verge piece widely-acknowledged to be the "straw that broke Google's back" focuses on several instances of "patient brokering". Patient Brokering was the practice of advertisers or lead aggregators posing as treatment centers - usually in a google searcher's local area - then "selling them off" to a partner center, often out-of-state, and, as was the case of the victim in the Verge article, often to Florida. Was this occurring: yes. We at Admit Scout monitored nearly 100% of the paid google search results for the most common/expensive keywords for the last year, and patient brokers were absolutely routinely occupying the top several sponsored slots for many Google searches up until the Adwords ban. Does it define the industry: an emphatic "no". What percentage are proper centers, with accreditation? At least 75%. Now that we've been without Adwords for nine months, it's probably closer to 85%. I'm familiar with the websites and marketing material of the vast majority of these centers, and I've spoken personally to the owners of hundreds. The picture that emerges is not of unscrupulous profiteers, but of good people, trying and mostly succeeding to help save lives, and - it's true - also trying to stay-in-business in the process. This was the other major abuse the Verge piece exposed. It consists of "information sites" - either wholly owned by rehab centers, or with financial relationships with them - posing as impartial review sites, collecting information from addicts seeking treatment, then passing it onto one of its partners. Was this occurring: yes. After the Verge and New York Times articles, and Florida's subsequent crackdown, many such sites took measures to comply with the "letter-of-the-law", listing their partners, and disclosing the fact of those relationships. Does it define the industry: no, with shades-of-gray. In the marketing sphere, the "pay per lead" model, whereby the marketer operates their own website, and - with some clever dance moves to comply with the letter of the law - delivers calls to treatment centers with whom they have a relationship, is still considered The Cadillac way to do business. First, branded advertising (in which treatment centers advertise directly to potential clients, as themselves) perform volumes better than so-called "impartial" websites. We operated a "hub" website for a few months to prove that Facebook advertising works. We disclosed all over our site that we were accepting zero money from treatment centers, and the deliverable we offered was a recommendation - a pretty low bar. Still, ads we've run directly on behalf of our clients have performed three-to-fourfold better. Second, as a side effect of getting retargeted from the many industry websites we've seen, we've seen a ton of addiction treatment Facebook ads, and at-most 25% of the volume is from lead aggregators. As a proportion of the industry, that 25-or-so percent accounts for only a small handful of companies. i.e. the vast majority of the industry is not doing this. Do a linkedIn search for Addiction Treatment Centers, and see how many have a JCOA or CARF accreditation. The vast majority. Are JCOA and CARF government entities? No. But they represent a good-faith effort by many treatment providers to impose standards on the industry. What's more, a great many treatment providers employ PhDs and MDs on their staffs, and offer evidence-based therapies. They're usually offered in conjunction with evidence-based therapies. 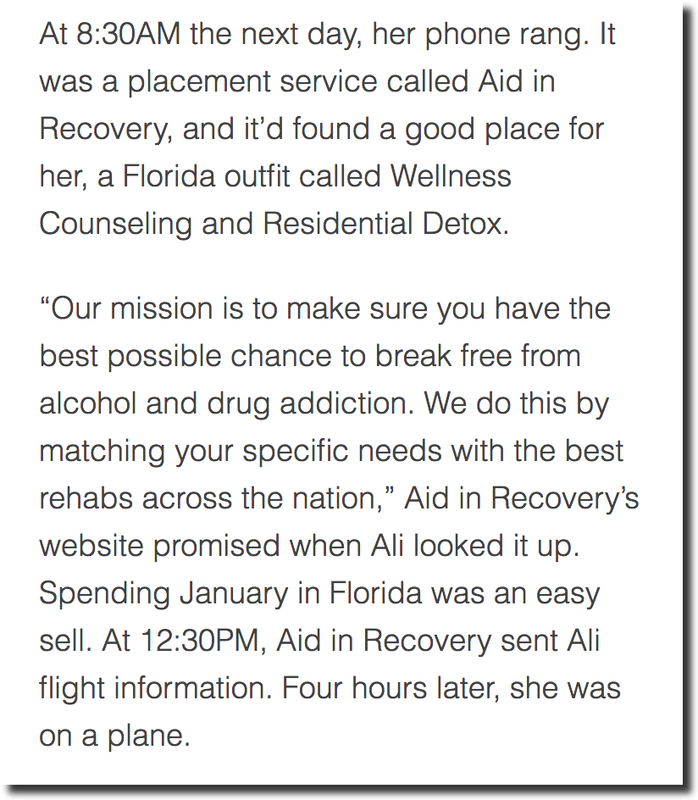 All-the-same, the question: how big a problem are fly-by-night rehab facilities, with untrained staff, like the one the fraud-victim in The Verge article experienced? Less of a problem after the Adwords hiatus, for the simple reason that most treatment facilities couldn't survive the ban without referral relationships with legitimate medical professionals. Do they still exist? Doubtless. But saying "these bad apples don't represent us, and here's how to tell a legitimate facility" is a far cry from what most of the treatment industry is saying, both in the examples I posted above, and in countless others. Oliver was careful to separate the practice of charging premium prices for premium services - exactly the way a top-flight plastic surgeon would - from the so-called "Florida Shuffle", the allegation some whistle-blowers made regarding the practice of benefiting from relapse, via repeat insurance payouts. Others, like The Verge, were less circumspect, juxtaposing descriptions of the average "cost-per-click" of an addiction lead with stories about legitimate fraud. Some people committed fraud, and benefited from insurance payouts. Most provide legitimate, high-quality services. A subset of those charge premium prices. How you feel about therapy providers charging a lot of money is up-to-you. (One thing to consider is that in the Malibus of the world, there was a client base crying out for rehab with luxury and discretion, and happy to pay for it.) But we should be clear that that's not the same as the Florida Shuffle. Does it define the industry? As "luxury" rehabs are a small fraction of even residential facilities, I'd say "no". But even if it did, it's not even the same ethical category as the abuses I described above. As a footnote, when I speak to the owners of some of these "luxury" facilities, they're not telling me "I wish we could get more chronic addicts in the door." It's usually more like "I'm sick of people who don't really want to get better and are just skipping from one rehab to another. If you can help us reach people who actually want to get sober, we'd love that." Now that I've covered the major allegations people in the media have leveled at the treatment industry, a quick discussion of why it's so potentially harmful to accept the media narrative unchallenged. By writing things like "there are so many shady treatment facilities out there", or "the rehab industry is...a disaster", you're conceding the point, and now, for any legitimate treatment provider, the conversation begins with "how are you different from this broken industry." It's of-a-type with candidates for national office running "against congress", and it carries the same risk: you can only run "against congress" for so long before somebody's going to ask "why are you still in congress"? If addiction treatment providers think the entire industry is broken, why are they still participants? What gets lost, as soon as you concede that fraudsters define the industry as-a-whole, are the success-stories, and the people who devote their lives, despite a growing headwind of public criticism, to saving others from addiction. We also lose the ability to have a high-resolution discussion about what the majority of the industry should be doing better - for instance channeling more of the high payouts from luxury services to provide a similar level of care to poor and underprivileged addicts - and degenerate into a "witch hunt", in which we throw the good out with the bad. What if, instead of apologizing for the treatment industry, providers straightened-their-backs, and carried themselves with pride? What if, instead of conceding-the-point when responding to critics, legitimate treatment providers pushed back, with questions like "should we get rid of all investment because of Bernie Madoff?" What if, instead of #anotherwayispossible, they used hashtags like #fraudstersdontrepresentus? Oliver, Reply All, and others are doing their jobs - exposing abuse. The industry's job is to tell its side of the story. Newer PostWhat is "Ethical Treatment Marketing"? Older PostAdwords is Back for Addiction Treatment Providers - Should You Use It?